Fresh basil is awesome in the summer. You can add it to bruschetta toppings, pasta sauces, or make pesto from scratch. It smells great – way better than that dried stuff in the shaker jar. It can be expensive to buy fresh, but with a pot of dirt, a basil plant or seeds, and some elbow grease, you can grow as much as you like for yourself for far cheaper. It’s also more convenient to step outside than it is to run to the store! Basil can grow as large two feet tall. I did this entirely by accident during my first year of apartment gardening; I grew a plant so large that it dwarfed the container I had planted it in. 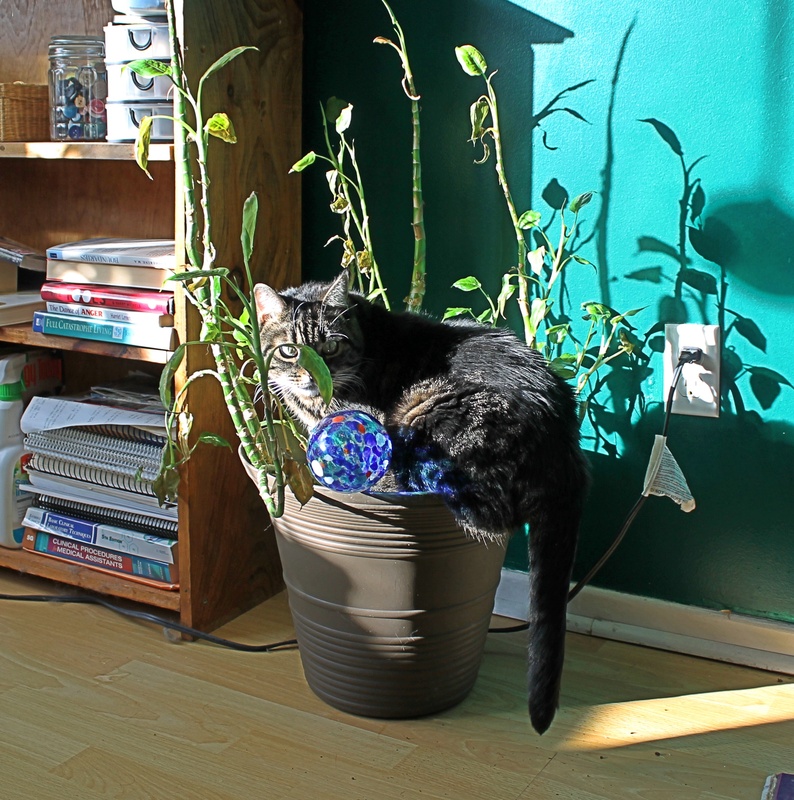 As you can see, I’ve got a large basil and a smaller plant. The large basil is one of the more common varieties, Sweet Genovese. I’m not sure what the smaller basil is, but it’s the type with leaves that are small and light green. Whatever it is, I don’t recommend it. I’ve never had much luck with it. Anyway, I’ve managed to duplicate the giant basil each year by following three basic guidelines. This may sound counter-intuitive, but cutting the leaves stimulate growth. For each leaf you cut off, two more will grow in its place. The Bountiful Container by McGee and Stuckey’s recommends pinching off an inch of the growing tips in order to stimulate the growth of side branches. When the plant starts to flower, they recommend cutting back the main stem to where there are four leaves left. That last step might sound extreme, but I tried it one year and it worked. If you’re going to grow it big, you’re going to need room for root growth. That may sound like a no-brainer, but I see so many homes with teeny little pots with cute little basils growing in them. They look cute, and small pots are fine for the casual basil user, but monster plants need large containers. It should be at least 8 inches deep with good drainage. I recommend a pot that’s at least 12 inches wide simply because the plant tips over easily once it reaches a certain height and level of bushiness. The container should be stable enough to stay upright once this happens. If you are willing to buy or make a self-watering container, that’s a bonus. The point of a self-watering container is two-fold. One, you don’t need to worry about watering your plants every single day. Two, it forces the plant to grow deeper and stronger roots as it reaches for the water in the bottom layer of the container. I myself use a Rubbermaid storage container that I built to be self-watering. It is 22 inches wide with a soil depth of 10 inches. Beneath the layer of soil are several inches of empty space, which makes up the water reservoir. In case anyone is wondering, I got the instructions for a DIY container from Fresh Food from Small Spaces by R.J. Ruppenthal. You can also buy them. I haven’t tried any, but I’ve heard good things about Earth Boxes. If you are using a fresh bag of soil with a “slow release” fertilizer formula, you should be okay your first year. However, if you’re using a lower quality soil or re-using soil from a previous year, fertilizer will help. Leafy growth needs nitrogen (N). Flowering and fruiting tends to use more phosphorus (P) and potassium (K). For this reason, fertilizers come in different ratios. When choosing fertilizer, look at the N:P:K ratio listed on the package and choose something that is either higher in N or completely balanced such as an 8:8:8 ratio. I use 8:7:6 for my basil plants, and 5:8:10 for tomato plants. That pretty much covers it. Another tip is to start the plant early, since it can take a while to get going. Have you grown anything gigantic? Basil, pumpkins, carrots, or something else?